A flurry of activity on the Danish bicycle ambassador front. 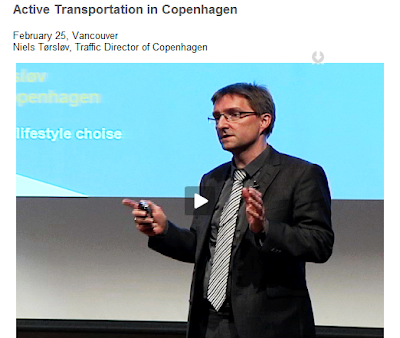 Niels Tørsløv, the Traffic Director of Copenhagen, was on a whistlestop tour of the North American west coast not long ago. It culminated with a lecture at Simon Fraser University in Vancouver. SFU is great at filming and internetting their lectures and you can see Niels speak right here on the SFU website. It's a 40 minute speech about Copenhagen's bicycle culture but also about Humanscaping - or humanizing cities and shaping public spaces. Well worth a look. You can also read a summary written by Brent Toderian, the Director of Planning for the City of Vancouver. He writes about it here. On the east coast, Andreas Rohl, the bicycle program manager for the City of Copenhagen, addressed more than 500 cycling advocates at the Ronald Reagan Building and International Trade Center in Washington, DC as part of the National Bike Summit. You can read one person's account of the best of the Copenhagen Bike Manager's Address to the National Bike Summit here. In the reverse direction, the Copenhagen Capacity website, which focuses on, among other things, foreigners doing business in Copenhagen has a page on their site for foreigners who are considering living and working in Copenhagen. Here, they advertise how you can have a rewarding career AND a fulfilling family life. We take that for given, but it's interesting to see it as a selling point. I love the photo, showing a typical Copenhagener in a suit on his bicycle. 10 reasons why Copenhagen is a great place to live and work. 2. Quality of life - one of the highest living standards in the world. There's a little film on this page about Copenhagen.